A French foundation entirely dedicated to cancer research. 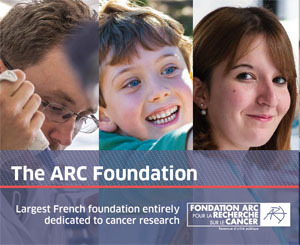 Through its scientific expertise and its ability to mobilize the best experts in France and abroad, the Fondation ARC plays a prominent role in cancer research. Its goal: cure 2 cancers out of 3 before 2025. Declared as being in the public interest, the Fondation ARC gathers the key players in the fight against cancer and guides research towards the development of effective therapies for every patient. Support research in the fight to eradicate cancers. About 40 % of cancer cases could be prevented through better lifestyle choices and effective prevention. Research is intended to reduce the risk of cancer and to detect the disease at its earliest possible stage. We develop research projects to improve knowledge about risks related to genetics, lifestyle behaviors and environment. There are over 200 different types of cancer. To improve our understanding of the disease is a constant challenge. In order to face such a complex disease, research must generate new knowledge enabling the emergence of new concepts. We implement research projects covering all fields of oncology: immunology, genetics, metabolism… We work side by side with researchers and physicians throughout their careers, from their early training years to their laboratory set-up, and we help them initiate and follow through their projects. Multidisciplinarity and knowledge dissemination are both necessary conditions for an efficient research. We need to boost the research environment by stimulating discussions and remove barriers to favor interdisciplinary actions. We carry out a large array of actions (congresses, networks…) in order to foster innovation. We rally every competence and galvanize people to speed up cancer research. With the emergence of precision medicine, our knowledge of cancer and the available treatments are now undergoing a groundbreaking transformation. The Fondation ARC is the main partner of major French clinical trials in precision cancer medicine: more than 10 million euros have been dedicated to this field during the last 3 years. We are actively involved in the development of technological innovations through cutting edge and disruptive projects. To cope with cancer, patients, survivors, relatives and experts require clear, accessible and trustworthy information. We unravel and make research and treatment information accessible to everyone. With the support of volunteer specialists, we publish brochures dedicated to the general public information and to help improve the quality of life of patients facing the disease. Identify, assess, federate and inform to promote innovation and to accelerate the fight against the disease. 100 % of our resources originate from private generosity. Over 230 000 donors choose our Foundation to support cancer research. Legacies, life insurances and donations represent more than half of our resources. Philanthropists are engaged by our sides to help develop major scientific projects. Individualised foundations under our aegis give founders the opportunity to fulfill their commitment in the fight against the disease. Companies work with us to favor our development and actions. Got a Question ? Ask us !